A classic children’s story of colourful country creatures is getting a musical makeover by a young cast at a north Norfolk theatre. The Wind in the Willows turns into gale force fun as Mr Toad’s “need for speed” sees him jailed for stealing a car and having his stately home taken over by weasels. He escapes from prison disguised as a washerwoman and seeks to grab Toad Hall back again with the help of his woodland pals Ratty, Mole and Badger. The story also includes a road crash, chase and a fight as well as gentler river rowing boat trips, a choir of mice, and a party finale. Co-director Michelle Thompson said: “The show promises to be fun for all the family with its larger-than-life characters, beautiful score and dynamic dance routines. “This is probably one of the first amateur productions of this version of Wind in the Willows and our young performers are very excited to take on the challenge. Sheringham’s Toad is 11-year-old James Shorten from Barton Turf, a pupil at Broadland High School, who played gang leader Dandy Dan in last year’s Little Theatre youth production Bugsy Malone, and who is also a member of Broadland Youth Choir. Other key roles include Ayrelia O’Leary-Leeson (14) as Ratty, Rosa Cormack (12) as Badger and Caius Law (14) as Mole. The other co-director is Charlie Randall. The Wind in the Willows musical runs at Sheringham Little Theatre from Tuesday April 16 to Saturday April 20, at 7.30pm nightly with a 2.30pm Saturday matinee. Tickets and information from the box office 01263 822347 or click here. 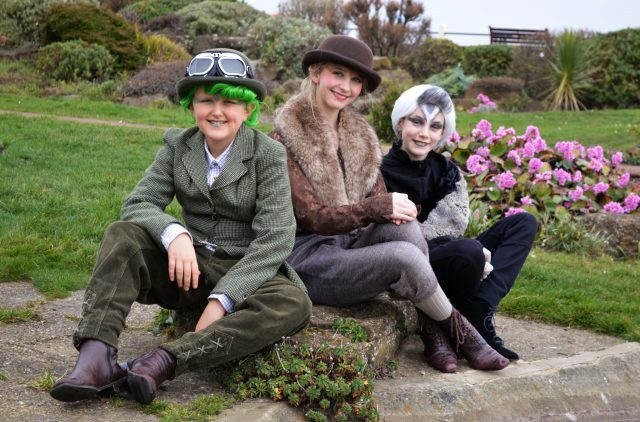 Toad (James Shorten) Ratty (Ayrelia O’Leary-Leeson) and Badger (Rosa Cormack) from the young cast of The Wind in the Willows musical at Sheringham Little Theatre.